...... All songs are in the MP3 format and can be played on any computer or on any MP3 Player including iPod, iPhone, cell phone, etc. Moreover, it also recommends the USA AIRPLAY HOT 100 each week and supports all digital players including iPod, cellphone, etc. Speed MP3 Downloader is a simple and neat utility for indexing and downloading your favorite music from Internet. Speed MP3 Downloader is so user-friendly that anybody can use it; it just takes a few clicks and less than 5 seconds to bring you the search results. In terms of safety, it is not a Peer-to-Peer program, so there is no risk from spyware or viruses. It brings you music by means of searching the public audio sites, which is 100% legal! And that's not all. Something you'll definitely love in this program is that it can run many searches in parallel. Users can also pretest the downloading mp3 files; if the files are not what they are looking for, users can stop downloading immediately to avoid wasting time. 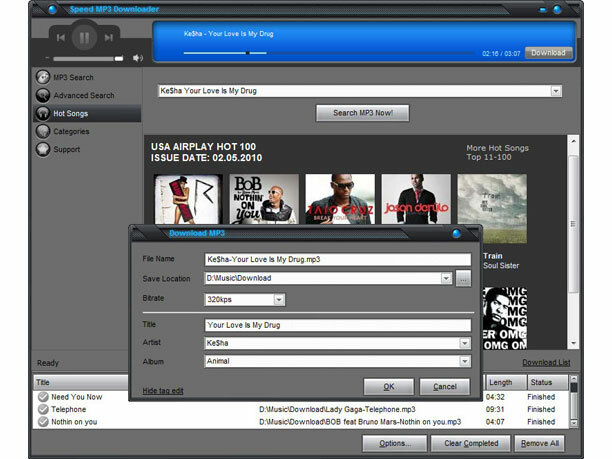 Qweas is providing links to Speed MP3 Downloader 2.2.8.2 as a courtesy, and makes no representations regarding Speed MP3 Downloader or any other applications or any information related thereto. Any questions, complaints or claims regarding this application Speed MP3 Downloader 2.2.8.2 must be directed to the appropriate software vendor. You may click the publisher link of Speed MP3 Downloader on the top of this page to get more details about the vendor.